It was a perfect day to race – cool and calm. We had 14 competitors in all kinds of boats including downriver race boats, kayaks, canoes, and c2s. Thanks to Immersion Research for the incredible prizes! Local favorite and kayaking master, Scott Shipley finished first in 20:27.2 winning the K1 long boat senior division. Boulder local and down river legend, Gary Lacy, finished 2nd in 21:55.5 placing 2nd in K1 long boat senior division. Lyons local and US National Junior Wild Water Team member, Spencer Huff finished 3rd overall in 23:11.35 placing first in K1 long boat junior division. Chairman of the Wildwater Committee of USA Canoe/ Kayak and eight time US national champion, John Pinyerd finished 4th overall in 24:30.8 in a C1. "The Lyons Outdoor Games Downriver Race Course was an A+ wildwater venue well suited for the intermediate level paddler to expert. The width of the North St Vrain Creek combined with the high walls of the bluffs made racers feel like they were racing down an alpine luge at mach speed. 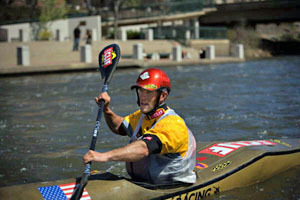 I look forward to returning to the Lyons Outdoor Games and this event growing on the national wildwater racing scene."